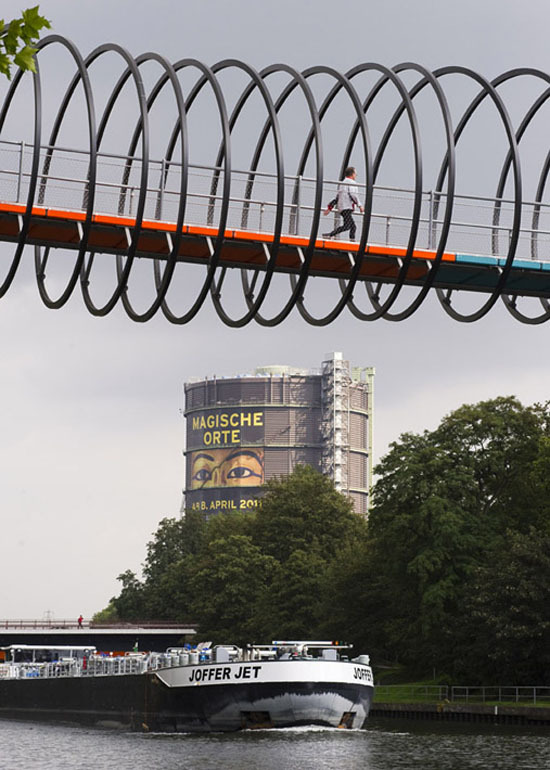 Following the design of the artist Tobias Rehberger, a colorful ribbon wrapped in a light, swinging spiral connects the two existing parks. The lightness of this design is due to the minimalist structural design of the stress ribbon bridge. Two steel ribbons made of high strength steel connect to the inclined supports across the canal. The resulting tension force is transferred into strong abutments through the outer vertical tension rods. The walkway consists of pre-cast concrete plates, bolted to the stress ribbon, to which the railing and spiral are attached. 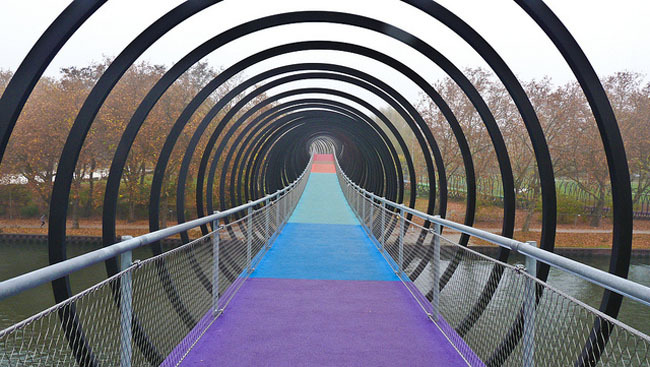 The springy synthetic pavement of the walkway as well as the colorful rhythmization of the concrete and coating amplifies the dynamic experience of the bridge. The colorful pavement pathway was carefully selected by Rehberger who had very specific ideas on its look. Then the bottom of the bridge was made to exactly match the colors on top in a separate material. It’s great how the nighttime illumination really accentuates the colorfulness. 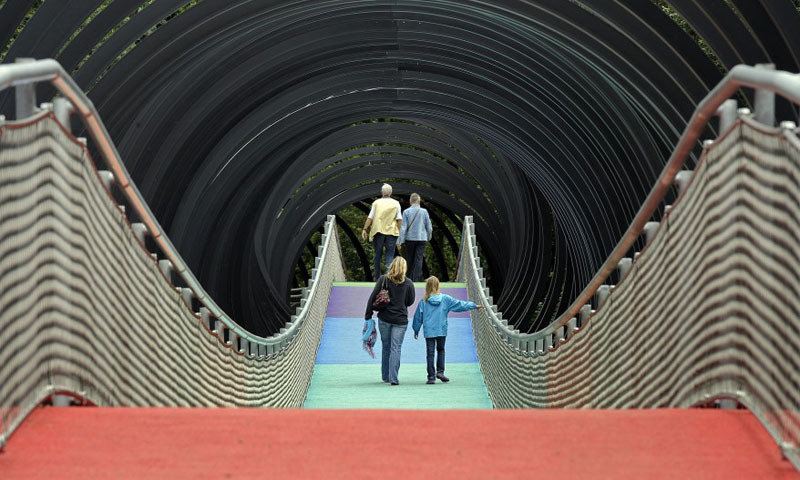 Seems to me that bouncing across the incredibly cool and unique Slinky Bridge could be a lot of fun, if maybe a little unsettling as well. If you like this bridge then you’ll probably enjoy the Tiger & Turtle Walkable Rollercoaster and the Twist Bridge as well. Photos: Dirk Jungholt’s flickr, Roman Mensing, Jens Stachowitz, and AP. This entry was posted in Architecture, Art, Fun, Just Plain Cool. Bookmark the permalink. Reblogged this on Gold Tinted. Great civil engineering project. Would love to bring such a bridge to The Netherlands with ‘civieltechnisch adviesbureau Cidion‘.